I found that the NB10 would reliably go in to suspend, but would not reliably resume. Resuming sometimes resulted on a power-on and the backlight coming back on, but nothing showing on the screen. Pressing the caps-lock key did toggle the light, and the laptop’s IP did answer pings and incoming ssh requests after resume, showing that the system was alive. This appears to have been caused by a problem with the keyboard controller (which also runs the trackpad) not being correctly re-initialised on resume. The screen remains blank because of the inactivity timeout. Appending “i8042.reset i8042.nomux=1” to the kernel commandline fixes this. After this, I found both suspend-to-RAM and suspend-to-disk (hibernate) to work reliably. The built-in Realtek RTL8101E wired ethernet remains broken after a resume from either suspend or hibernation, irrespective of whether the nonfree firmware-realtek package is installed. Finding information about the current NB10 online is complicated by Toshiba having made a model called NB10 before. 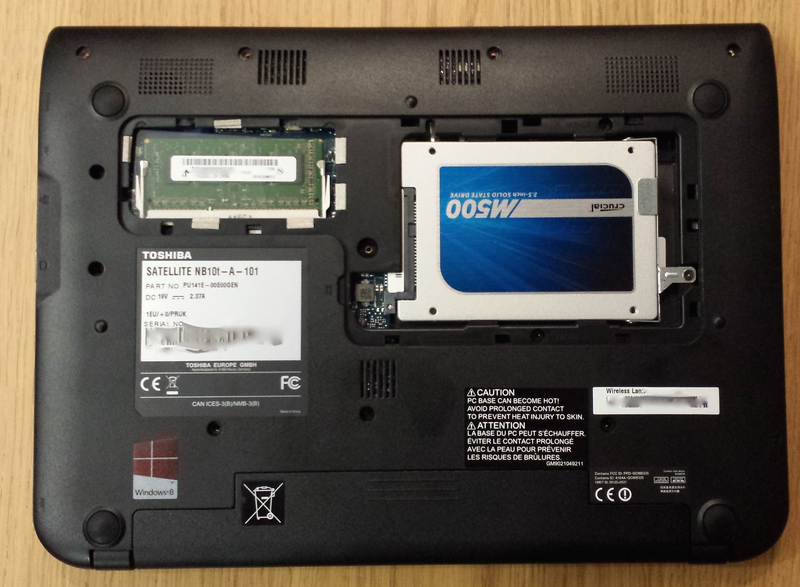 The previous NB10 was a netbook from the 2007/2008 vintage with the old Atom N270 CPU. It’s not clear to me how widely it was sold – I suspect it was restricted to a limited number of countries. Notebookcheck review – very comprehensive with lots of technical detail. Not very complimentary and does not recommend the NB10. Revoo (crowdsourced) reviews – much less technical. I’ve started a linlap.com page about it. Toshiba site – note that there are no Windows 7 drivers. You can download the BIOS from here (current version at time of writing is 1.20) – unfortunately you will need Windows to run the BIOS flashing program. Toshiba appear to have several forums: Europe has some information. There’s also a US/World forum (with nothing useful at time of writing). These forums appear to be heavily “curated” with threads suggestive of difficulty with the product being silently disappeared. At the time I made my purchase, a forum search for NB10 would find numerous threads about problems with UEFI booting. All of these threads have vanished now. Toshiba have a website and a mailing list about running Linux on their hardware. Sadly, both appear to be abandoned. I bought my NB10 in the UK from Argos. Their returns policy is relatively friendly if a machine turns out not to be suitable and their stores are everywhere. I paid £299.99 – prices seem to change daily. There are several suppliers on Amazon and Ebay. There seem to be several different models on offer – check carefully which one you are buying. So do the co-op and Misco at the time of writing. If you’re in the UK, always check Hotukdeals for offers before making a major purchase like a laptop. If the backlight adjustment keys (Fn-F2/Fn-F3) don’t work in Linux for you, try booting with “acpi_backlight=vendor” on the kernel commandline. This should give you working backlight control in X using the ordinary Intel xserver. 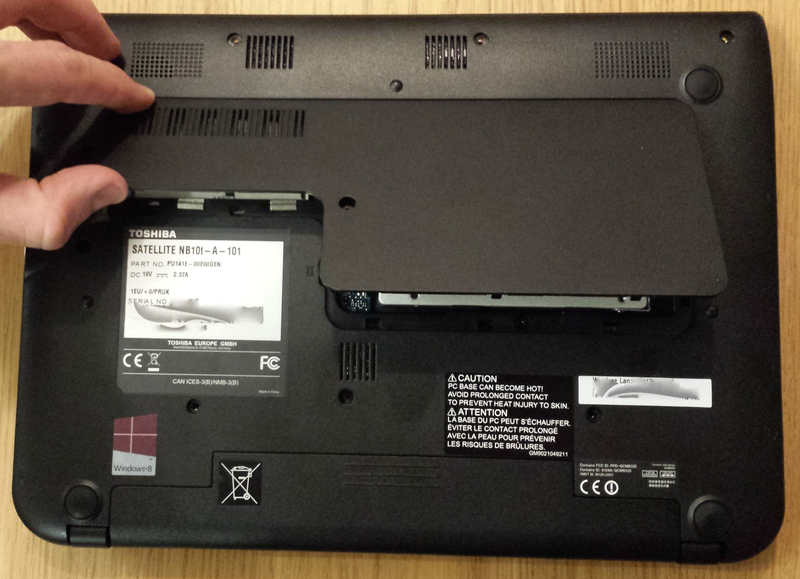 It’s reasonably easy to get the back cover off the NB10 without damaging anything if you are careful and patient. The only tools needed are an M2 (small phillips) screwsdriver, and a soft plastic tool for prizing plastic apart (“spudger”) – I used an old plastic ruler. If you use a tool made from soft plastic, you will avoid marking the NB10’s case at all and there will be no sign it has ever been open. Helpfully, all the screws are the same (M2XL5), so there’s no need to keep a separate record of where each one came from. You can put them all in one container as you go. The first step is to switch the NB10 off and turn it over. 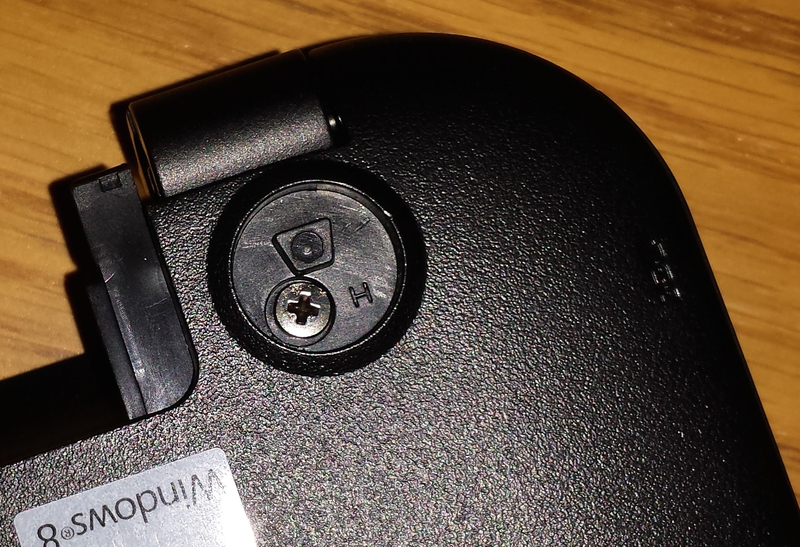 Unplug the charger, undo the two battery screws and remove the battery. You can then remove the four screws along the front, and the other three – two beside the VGA and ethernet ports, and one near the battery. Now that all of the screws are out, insert your plastic tool into the gap between the two halves of the plastic shell. Underneath the VGA connector is a good place to start this. 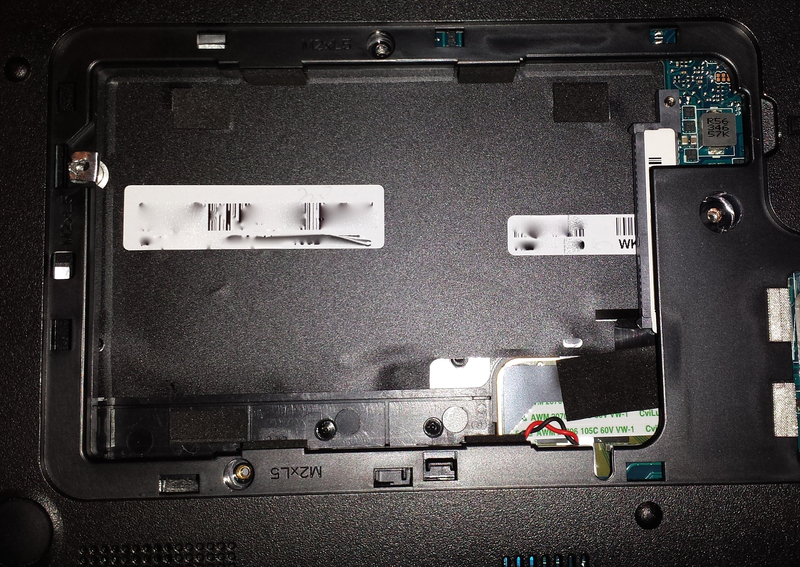 Run the tool gently around the edge of the laptop, pressing the two sides apart. There is plenty of flex in the plastic so don’t be afraid to pull at it a little. When you reach one of the clips which hold the halves together, put the plastic tool against it and push inwards to free it. Once all the clips are loosened and your tool runs freely along the outside edge of the NB10 right up to the battery space, you’re ready to pull the two halves apart. 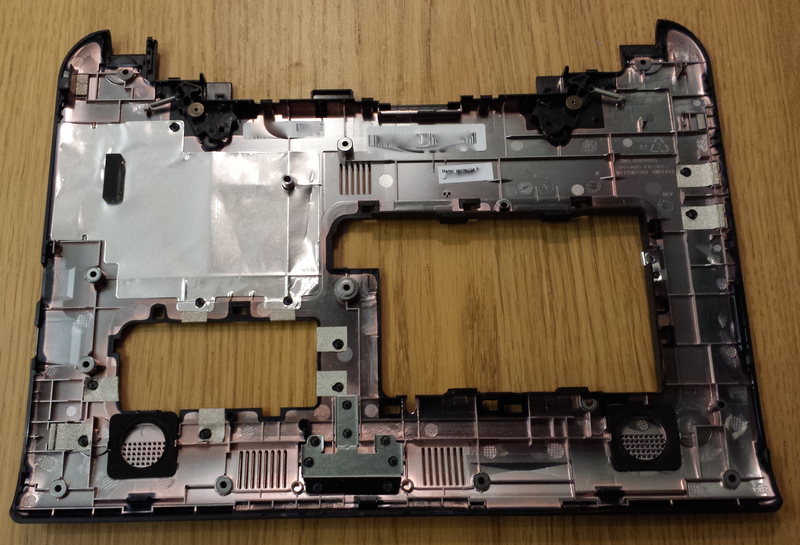 Having repeated the disassembly on a colleague’s machine, there might be an easier way than this. it appears that if you gently pull the two halves of the base apart, starting in the battery compartment, you may not need the plastic tool at all. Although there is no actual adhesive used, the holes for the speakers in the rear cover fit quite snugly around the speakers and tend to stop the halves from separating. You may find it useful to flex the case around the wrist-rest and press it down in the centre of the wrist rest while you pull the rear cover away gently. No fan, just a heatsink. 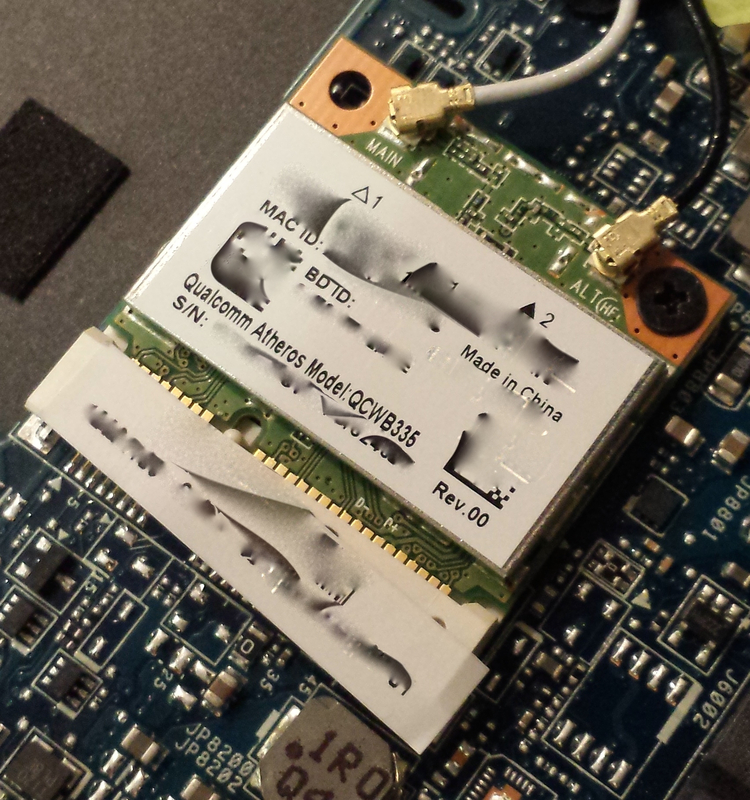 Mini-PCIE WLAN card is a QCWB335 (combined Wifi 802.11b/g/n 1×1 and Bluetooth 4.0) with both antennas connected – nice to see in a low-end laptop. Space only permits a half-size Mini-PCIE card to be used. 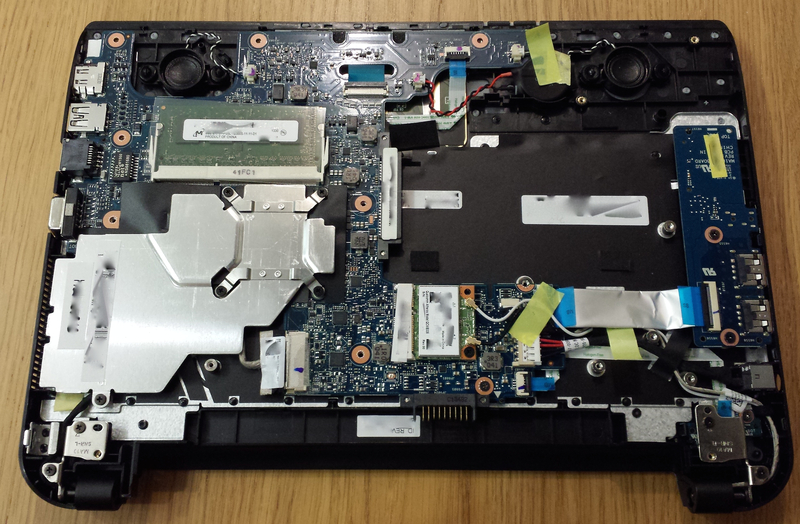 Reassembly is simple – just press the two halves back together and re-insert the screws. The NB10 ships with a 3-cell 24Wh battery. It’s 10.8V 2100mAh and has model number PA5170U-1BRS. Toshiba’s quoted battery life (for the NB10t-a-101 which I have) is 3 hours 30 minutes. The battery is removable, and the system will boot and run without it, but it requires two screws to be removed and a little bit of persuasion – so it can’t really be ‘hot-swapped’ while the system is running. Power consumption is dramatically reduced by running the Intel “powertop” utility and implementing its suggestions. Reviewers have quoted “idle” runtimes of 5h30 and “full load” of 2h. This approximately matches my experience – 2h with the brightness at maximum and my Android handset charging from a USB port. In typical use I see 4h30 of runtime with the brightness at about 1/4. As expected, there is little impact from switching the HDD to an SSD.